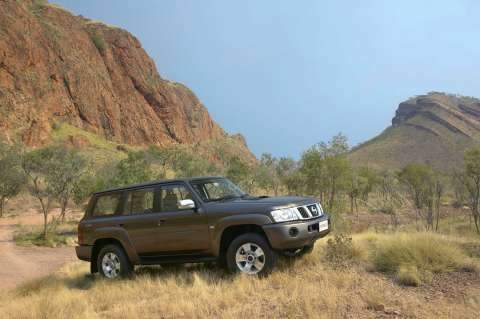 Nissan Australia has announced a new addition to the legendary Patrol range – the Patrol Ti 3.0-litre turbo diesel featuring an all-new satellite navigation and reversing camera system – available from October 2006. The stylish seven-seat Patrol Ti 3.0-litre will head up the current range of Patrol diesel vehicles, complementing the existing range of entry level DX, mid-spec ST, ST-S and ST-L models. Available with both manual and automatic transmissions, the turbo diesel Patrol Ti is powered by the popular ZD30 3.0-litre turbo diesel engine which delivers 118 kW @ 3,600 rpm of power with 380 Nm @ 2,000 rpm of torque. The standard of features is high on the top-of-the-range Ti and includes climate control, rear air-conditioning, leather trim, drivers seat height and lumber adjustment, power windows & mirrors, central locking, in-dash six-stack CD, steering wheel audio controls, power tilt/slide sunroof and 17” alloy wheels. A sophisticated satellite navigation system is fully integrated in the centre dashboard, allowing easy access to information. A reversing camera system is also standard on this model, an added safety feature bonus. The Ti 3.0-litre turbo diesel specification is based on the current Patrol Ti 4.8-litre petrol and boasts important safety features including ABS brakes, driver and front passenger SRS airbags and side impact SRS airbags. Ross Booth, general manager of marketing for Nissan Australia believes the new diesel version of the luxurious Patrol Ti model will be a popular choice. “The addition of a Ti variant with a 3.0-litre turbo diesel engine is great news for prestige 4x4 customers, providing the proven economy of diesel in a luxury Patrol wagon,” he said. Recommended retail pricing for the new Patrol Ti 3.0-litre turbo diesel is $65,990^ (manual transmission) and $68,990^ (automatic transmission). ^Price excludes dealer delivery and on-road costs.